If you’re looking for the best things to do in Athens, I would suggest concentrating on the ancient sites. Here is my suggested itinerary for how to do ancient Athens in 3 days. Athens is a bustling city, full of life. In many ways, it is a modern city full of bars and restaurants and contemporary culture. But there is no way to avoid its ancient history. Walking down the streets, ruins appear in the most unlikely of places – next to fast food joints, underneath office buildings and in subway stations. These reminders of a bygone era are intertwined with modern Athens and make it the city it is today. 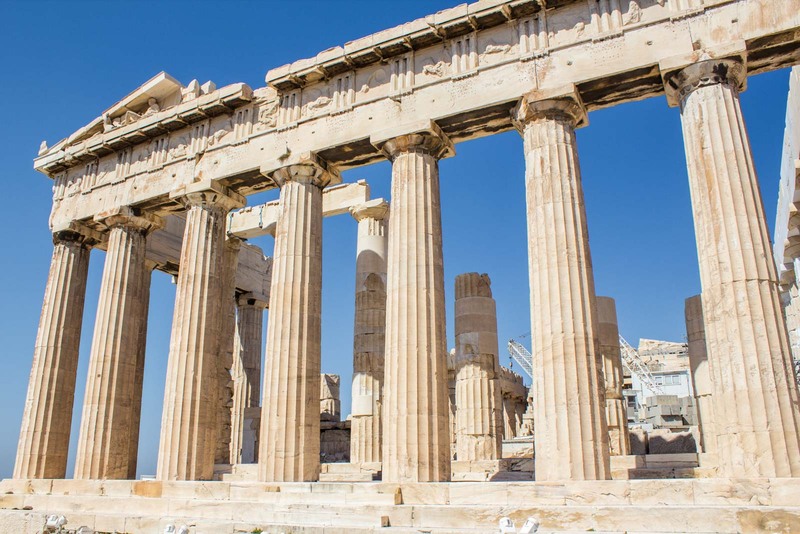 The Greeks are rightfully proud of their history and the classical culture that spawned some of the most important systems that we live with today – democracy, mathematics, philosophy, theatre. They have worked hard to protect the physical assets of this time and present them in authentic and interesting ways. 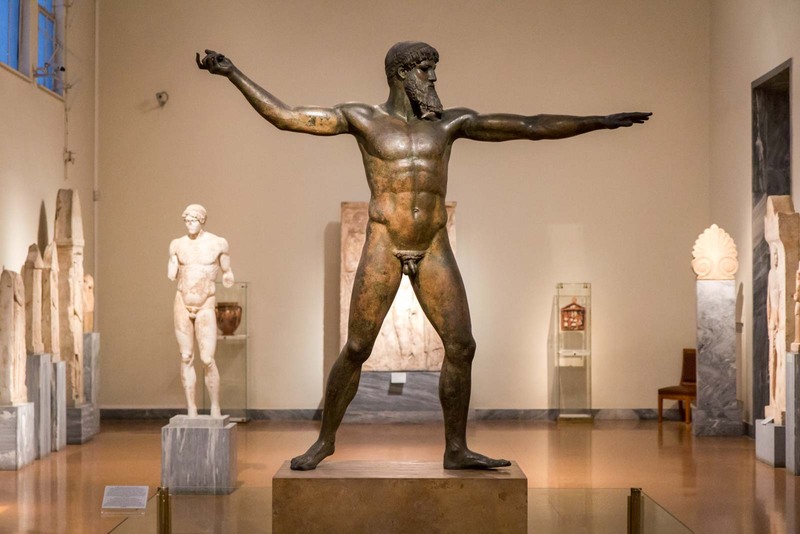 There are many ways to approach a visit to the Greek capital. One possibility is to focus on the ancient culture in the city. That’s what I did on a recent 3-day trip to Athens. 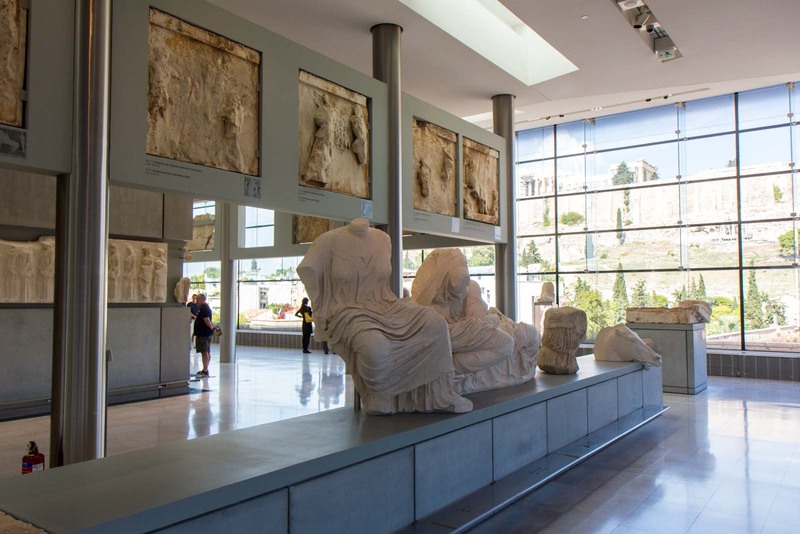 But I found that no matter how hard I tried, there just wasn’t enough time to fit in all of the incredible sights and museums related to the classical period into my Athens itinerary. 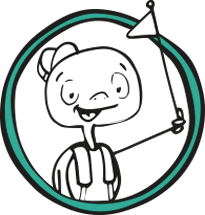 It can seem a bit overwhelming at first and – other than some of the obvious sites – it’s difficult to know which of the multitude of other options are worth prioritising. 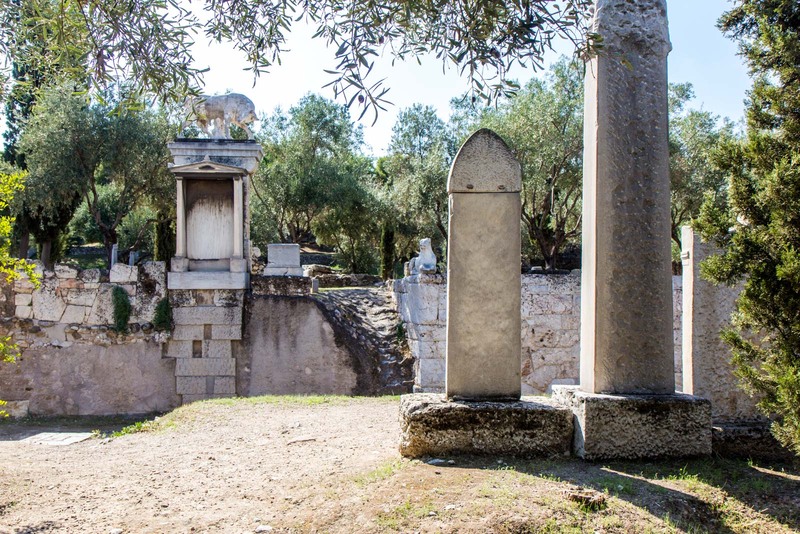 To help you on your next visit to Athens, I have put together a three day itinerary for a great exploration of the ancient culture. It includes the highlights of the city but also a few other lesser-known places. I hope this helps with your trip planning! 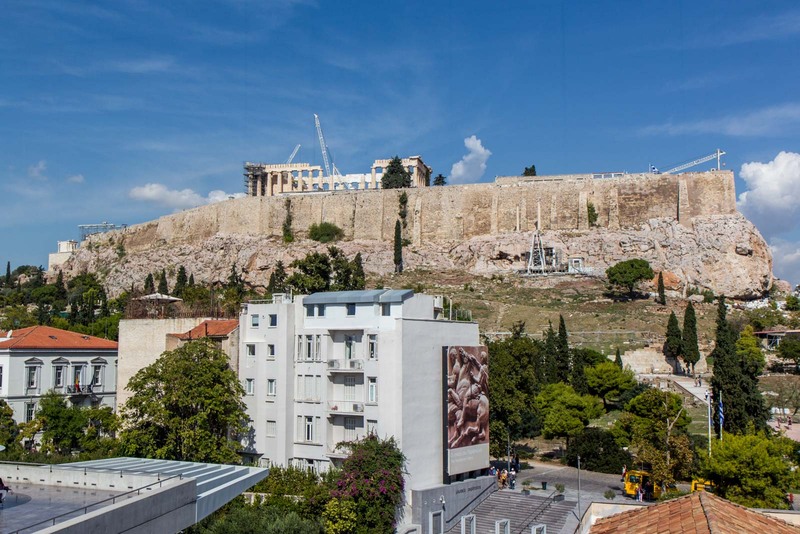 Where better place to start but at the Acropolis, the most recognisable landmark in Athens. It takes a couple of hours to explore the site and there is a bit of uphill walking. That means it’s also a good idea to start here early in the morning before the day gets too hot (especially in the warmer months). There are the ruins of buildings and monuments on ground level but the highlights are on the top, where the Parthenon takes centre stage. 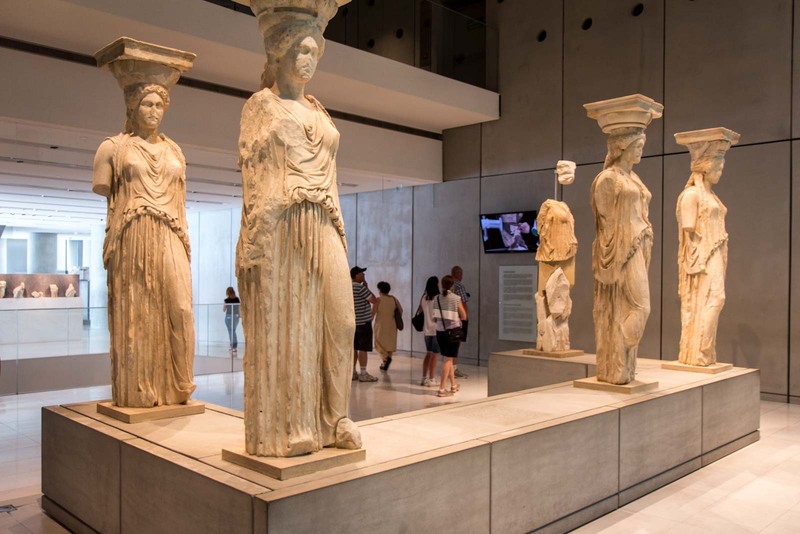 No visit to the Acropolis is complete without also visiting the excellent Acropolis Museum at the base of the site. This large and modern building has an extensive collection of artefacts that were found in the area. It gives you a good impression of how it would once have been laid out and decorated. From the Acropolis Museum, it’s only a five minute walk to the Temple of Olympian Zeus, through Hadrian’s Arch. This impressive temple was built in the 6th century BC and, even though only a small section of it is left, you can picture how large and grand it must once have been. If you buy the combined entry ticket for the Acropolis, then entrance is included here. After all of this, you’ll probably be hungry. 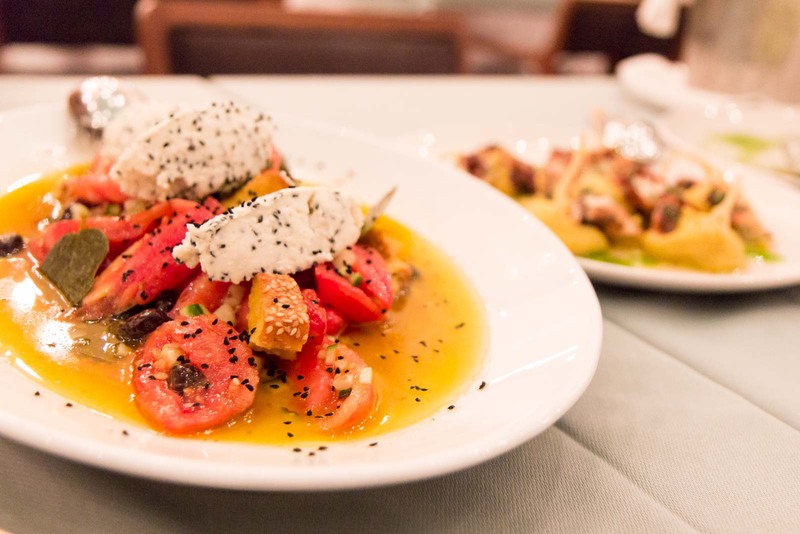 A great option for lunch is Aegli Zappiou, which is just a few minutes walk from the Temple of Olympian Zeus. Aegli Zappiou has a casual cafe area and a separate restaurant. There is a good selection of Greek and international food to choose from. There is also a fantastic view of The Zappeion building, which was built as the administrative centre of the first modern Olympic Games in 1896. After lunch, take a stroll through the Plaka district, which is just a few minutes from Aegli Zappiou, back towards the Acropolis. This is one of the oldest parts of the city although most of the buildings here now are from the 1800s. It is a rather touristy part of town but for good reason. The cute streets have little shops and cafes (if you are in need of a coffee) and quite a few small ancient monuments. 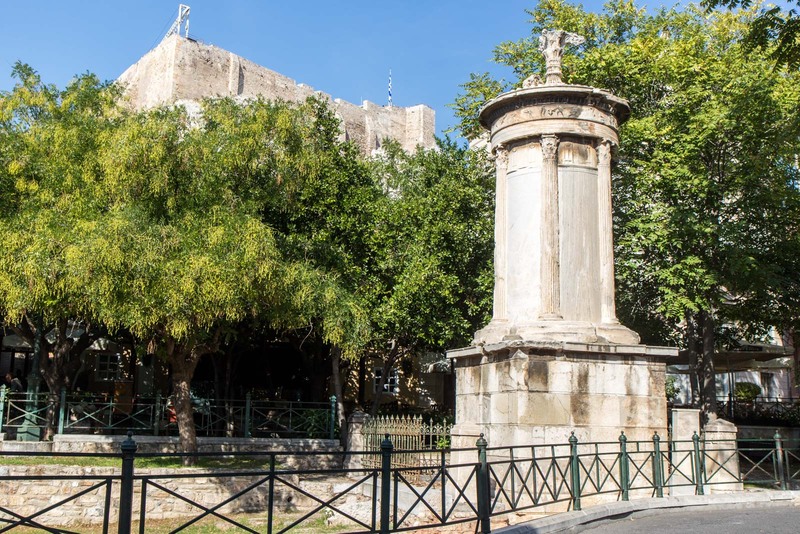 Look out for the Choragic Monument of Lysicrates, which is at the end of Lisikratous St.
A stroll through Plaka should bring you out the other end to a part of the city where there are several archaeological sites which are included in the combined Acropolis ticket. They are the Roman Agora, Hadrian’s Library and the Ancient Agora. Each of these sites have basic information displayed but you might consider hiring a local tour guide to show you around if you would like some detailed information about them. After seeing the Acropolis by day and up close, why not spend the evening admiring it at night. 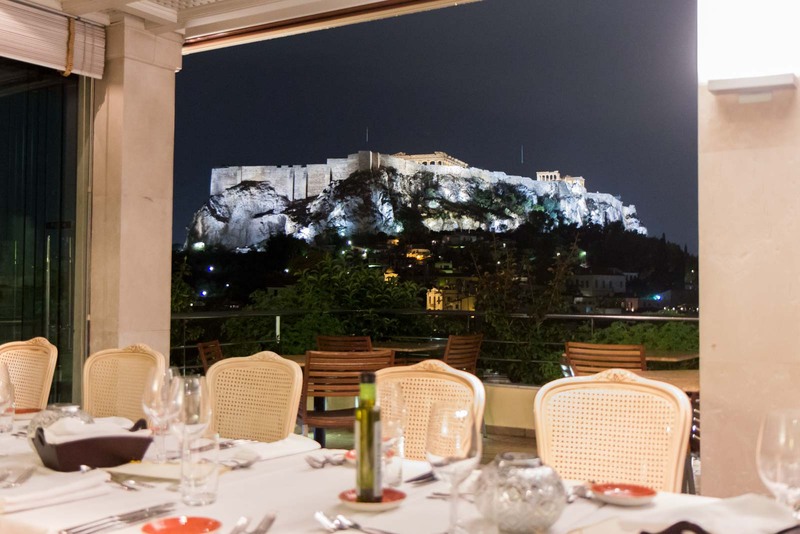 The restaurant at the Electra Palace Hotel has a fantastic view of the site from every table. There’s an inside and an outside area and the menu is fantastic. 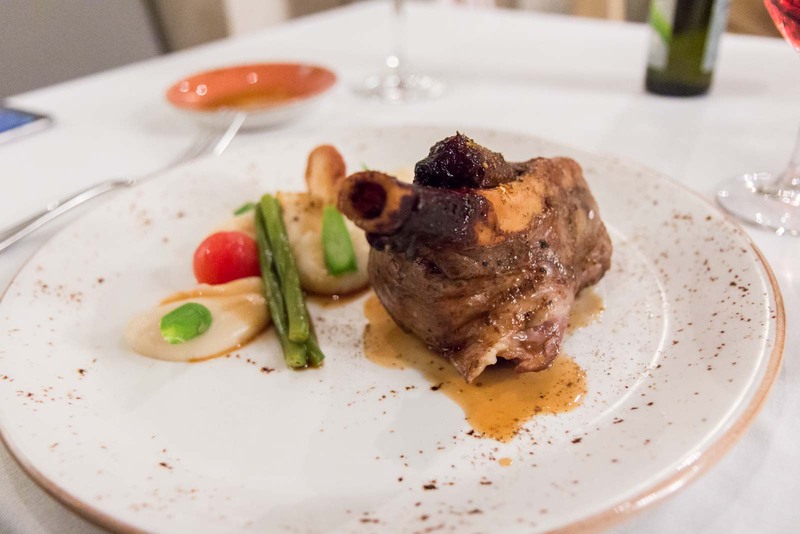 The speciality is modern Greek food and the friendly staff will help you match some of the local wines with the dishes you choose. There is an awesome program in the city called ‘This is My Athens’ which I would recommend taking part in this morning. 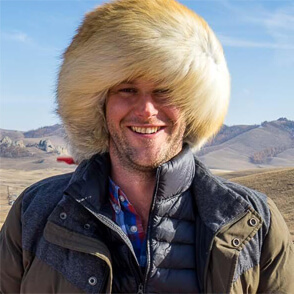 Local residents offer to take visitors around parts of the city and show them some of the things you might not know about as a tourist. The best thing about it is that it’s all completely free! The locals volunteer their time because they are proud of Athens and want you to see its best side. It’s also a great way to learn more about the city just by chatting. 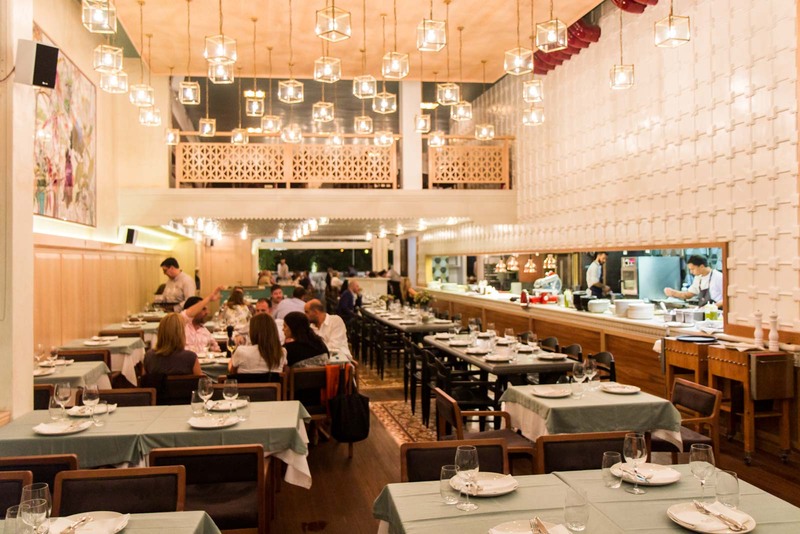 If you’re interested in trying some good local Greek food, a great option is to have lunch at the Byzantino restaurant in the Athens Hilton. The reason I recommend this is because they have a buffet lunch with a huge selection of Greek snacks and dishes. You can try a little bit of everything or just focus on the things you enjoy the most. It’s perfect if you’ve worked up a hunger while exploring in the morning – and it’s right near my suggested afternoon activities. Less than a ten minute walk from Byzantino is the Byzantine Museum, which is one of the best museums in Athens. There is an enormous collection of about 25,000 items from the 3rd century AD through to medieval times. While it is not what you might normally think of as ‘Ancient Greece’, this Byzantine period was influenced by the Classical Period and was extremely influential in the culture of Athens today. A little bit further down the same street is the main building of the Benaki Museum (I say ‘main’ building because there are some satellite buildings with specialty exhibitions). 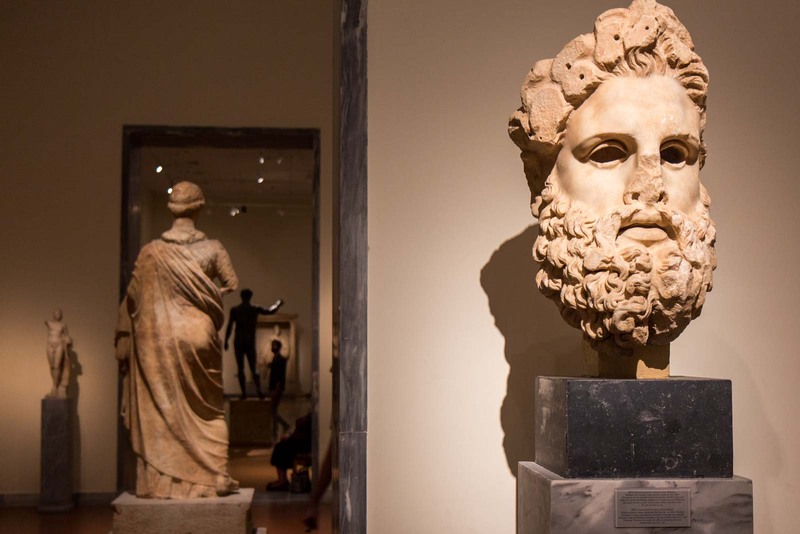 The Benaki Museum has an excellent collection of works from Ancient Greece on the ground floor. The really interesting thing about this museum, though, is that the exhibitions cover the entire Greece history up to the past century. Within the one building you can get a sense of all the important stages in the development of the country in a very well-presented way. This museum is a must-see! 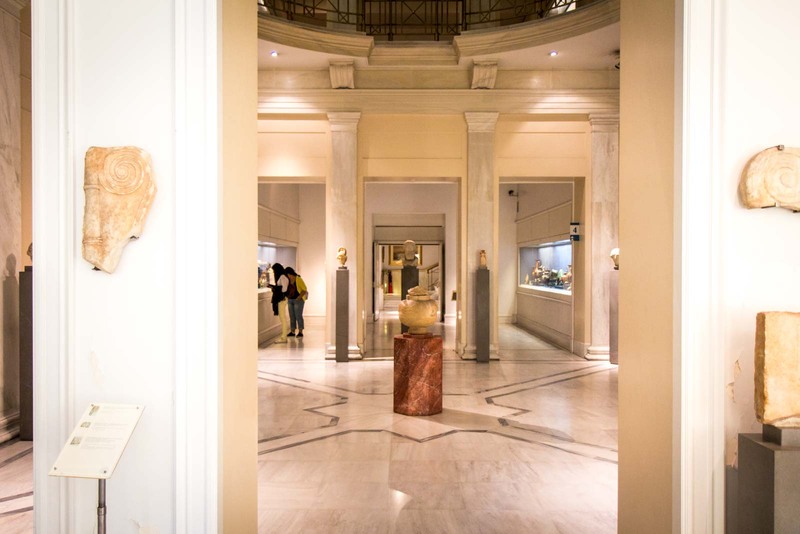 Nearby you’ll also find the Museum of Cycladic Art. This museum has a great collection of Greek antiquities with a focus on prehistoric art from the Cyclades islands in Aegean Sea. There are about 350 Cycladic pieces including marble sculpture, pottery and metalwork. 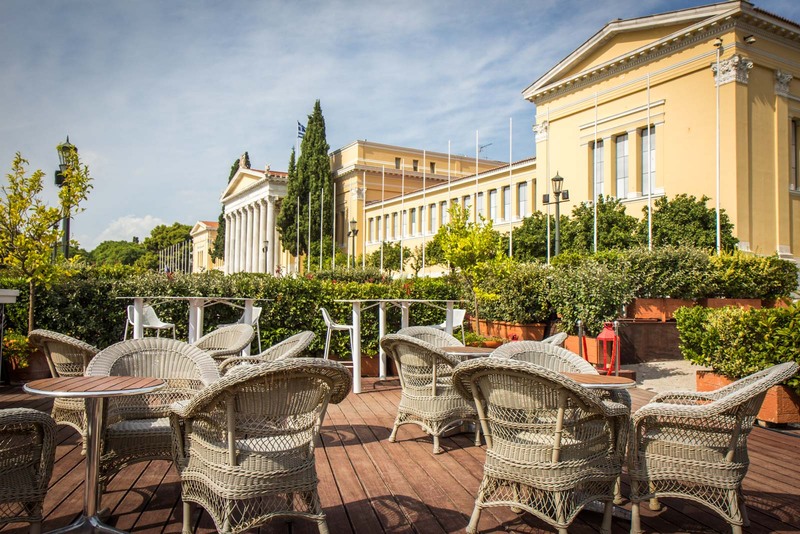 In the same part of town as these museums is an excellent restaurant that embraces the traditional Greek style of eating. Cookoovaya dishes are made to be shared and although the food has a modern flavour, it’s an authentic experience to have the large plates all on the table together. There is a lovely atmosphere at the restaurant with inside and outside areas and an excellent wine list to complement the dishes. There is no better museum in Athens to see artefacts from Ancient Greece than the National Archaeological Museum. It is an incredible collection with thousands of sculptures, pottery examples and other pieces of art and history. The works come from excavations across the country and show the development of the country through the styles and subjects of the depictions. 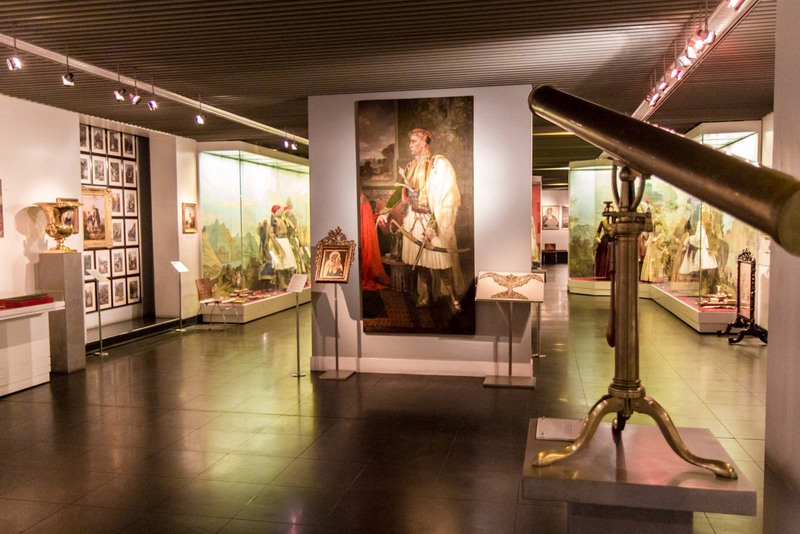 You could easily spend half a day exploring each of the rooms in the large museum. 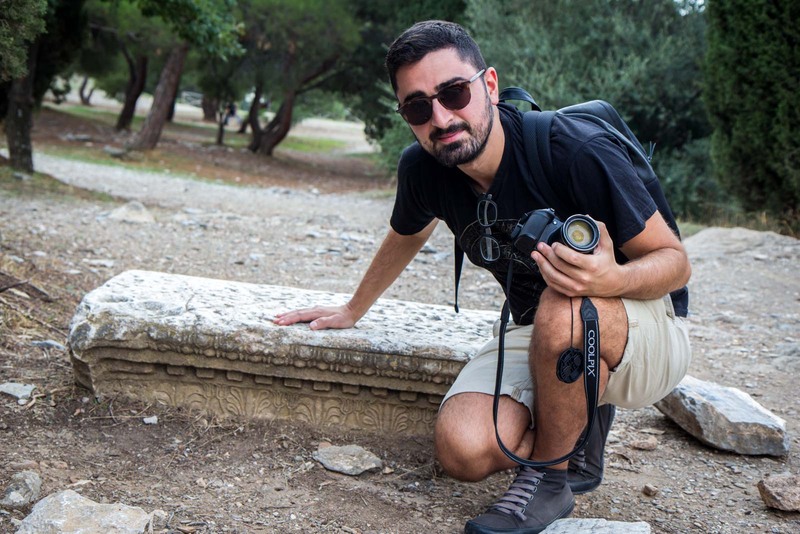 When I took part in the This is My Athens tour, my guide Alex took me to the Kerameikos Cemetery and this is something you could ask to do as well. If not, this morning would be a good time visit on your own (entrance is included in the combined Acropolis ticket). The ancient cemetery has about 1000 tombs from the 4th and 5th centuries BC. It was constructed on the edge of the old city wall, just outside the entrance, and was the burial ground for citizens of all classes. What is so fascinating about the site is the tombstones – each a piece of art in its own right. While you are in the area around Kerameikos Cemetery, a good option for lunch would be one of the new restaurants in the nearby Gazi district. This is an interesting part of Athens that has a bit of a ‘hipster’ vibe and is definitely on the up. There are lots of places to eat here so I’m not going to recommend any one in particular – have a wander and sit down somewhere that takes your fancy. It’s unlikely you’ll be displeased. This Byzantine complex was established in the 10th century on Mount Hymettus, overlooking Athens. The original church from this period is still accessible and some of the frescoes are in an excellent condition. 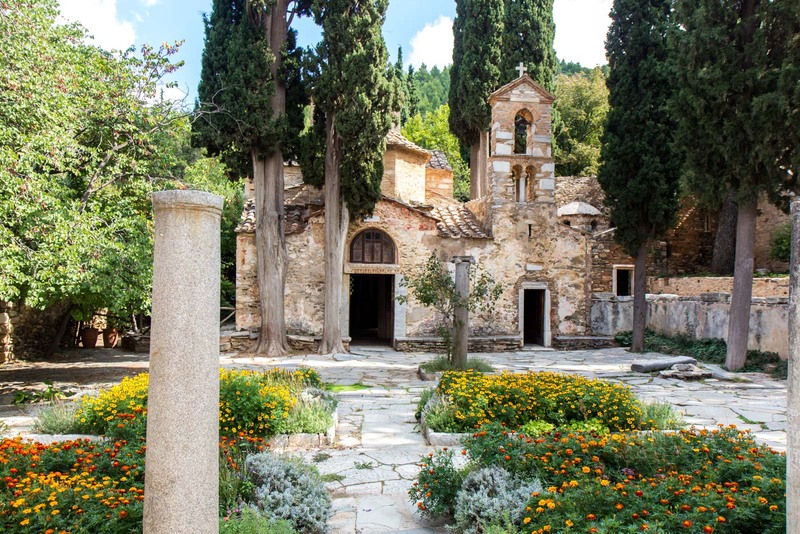 This Eastern Orthodox monastery is an important part of the story of Athens which, of course, did not stop after the Classical Period. An added bonus of visiting is the views of the city and the serene natural surroundings that you can go for a walk through. You’ll probably need to get a taxi here. On the outskirts of Athens is the Daphni Monastery, another Byzantine site. Daphni does not have as nice a setting but it is more significant and a much more impressive building. 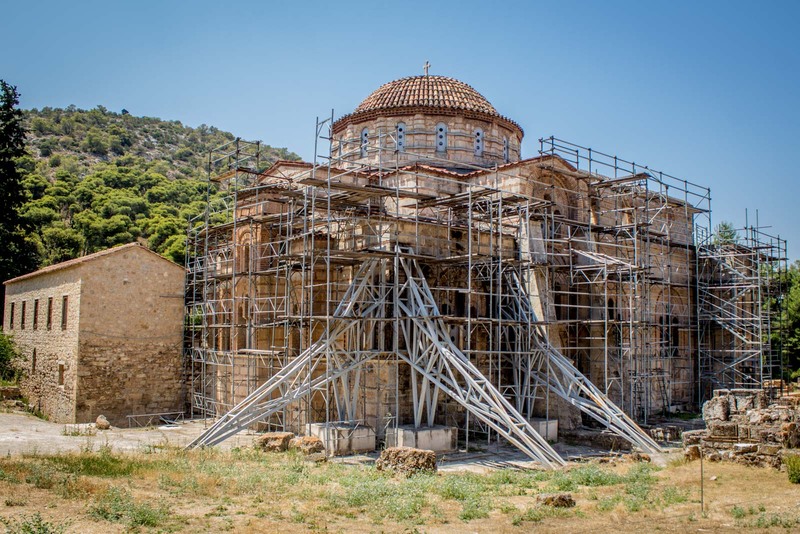 It is part of a World Heritage Site that includes other Byzantine monasteries in Greece. You will probably also need to get a taxi here – or you can get a bus or a metro/bus combination. You can find out more public transport information here. I hope this 3 day itinerary for Athens has been helpful. Please feel free to leave any other suggestions in the comments section at the bottom of the page. I know there is much more to do in this incredible city than is possible to fit into just three days! Great itinerary! 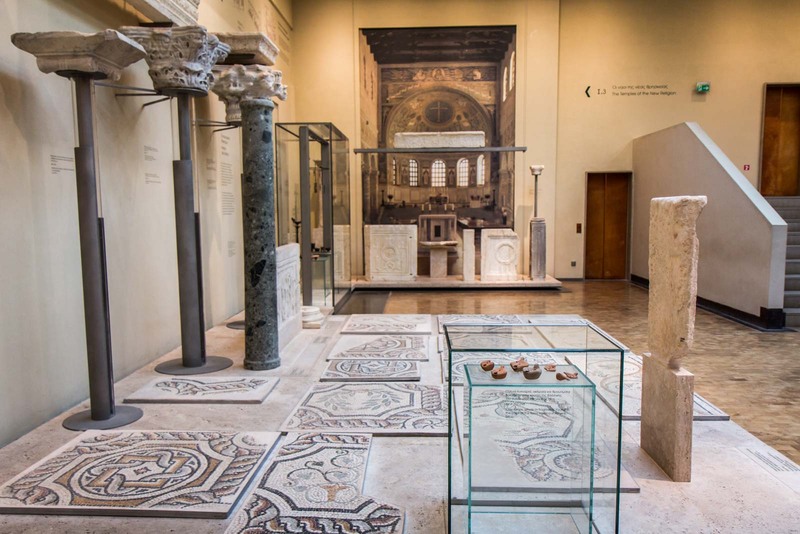 if I may make one suggestion I would suggest to visit the National Archaeological Museum first and then the Byzantine Museum, both on the same day because these museums complement each other and the Byzantine Museum picks up where the Archaeological Museum stops. Good suggestion, thanks for adding that in! I did the itinerary this way because of geography, more than historical chronology. But you are correct that it amakes more sense to do it this way to follow the history of Greee. Great post! So encouraging to visit Athens. I probably should schedule such a trip for next year. Thanks for inspiration. I hope you do get there and, if you do, you can try some of these tips. Let me know how you go! I really enjoyed your post and photos. Let me know if you ever visit Poland! Thanks Piotr. I have been to Poland once but it was just a short trip a few years ago. I’ve really wanted to go back and see more of the country so hopefully I’ll be able to get there at some point again soon! Nice suggestions. 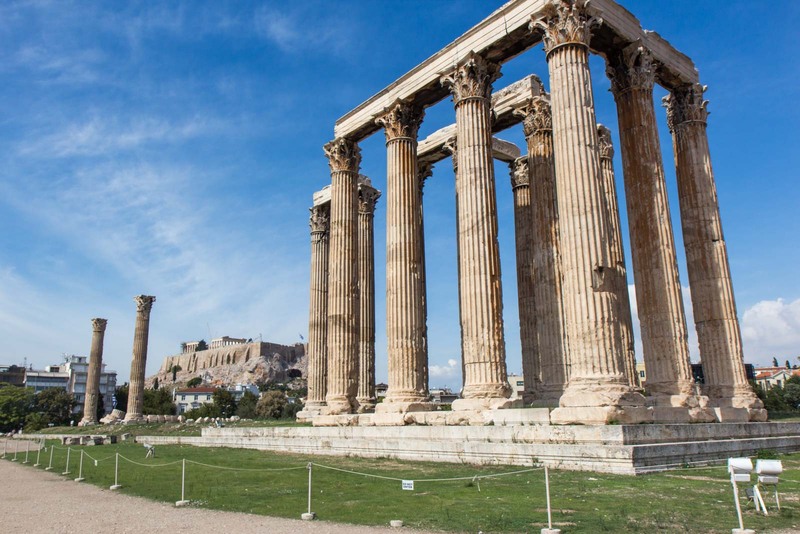 The history and culture of ancient ruins are amazing and beautiful, but Athens has more than just Greek ruins. The art in the Museum of Cycladic Art, the monasteries, and the food are all other great ways to explore Athens. Thanks for the post! 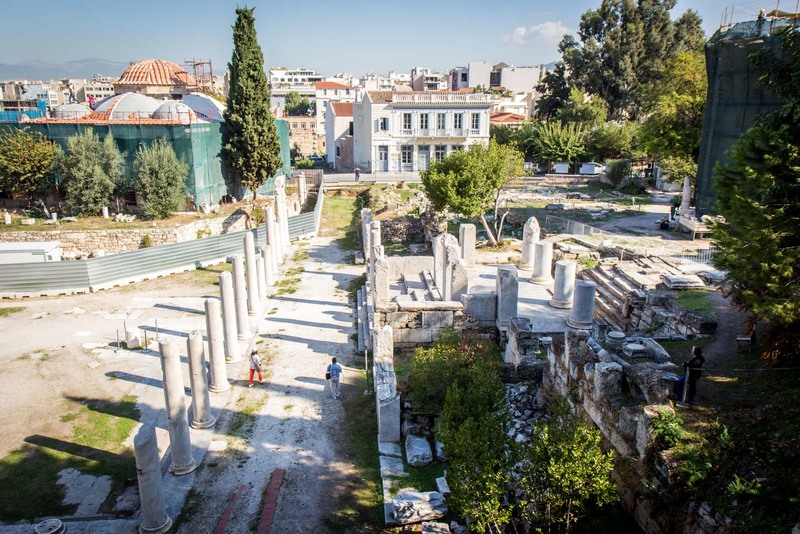 You can’t avoid the ruins in Athens – and you don’t want to either! But the museums are a real highlight as well and I really think any visitor should try to go to a couple of them. I visited Athens for some hours last spring. sad to say, I only spent around 3 hours in the city. Your suggested itinerary looks great. I wish, I will visit Athens again in the future..Wonderful images too! Safe travels to you. Athens deserves much more than just 3 hours! Even in 3 days, I don’t think I saw everything that I wanted to. I hope you get back there someday and can do a bit more. We’re planning a trip to Greece next year, and to get excited I have started to gather images of Greece. They’re all very nice but after a short while, they all look the same. Thank God yours are different!